Yes we finally get a brake from traveling and we are in Detroit Michigan my home town I actually don&apos;t live in Detroit though but I still love downtown Detroit. We got there at 4am so no one was around we went to our hotel rooms I shared one with Jonah and Daniel. When we got inside the rooms we were all on our phones after some time we all fell asleep. After that we went inside of footlocker and I bought one pair if shoes then we went to the vans store and Zach bought a pair of shoes. After that we went back to see what the boys were doing when I went in my hotel room it was so messy but I did not want to clean up their mess so I walked over it into the bathroom to take a mirror pic the caption was &apos;got that JB merch&apos; then I tagged him in it. After doing that I saw all of the boys in our hotel room "um why are all of you looking at me?" I asked weirdly "because we wanna see your house" Jack said "okay not creepy at all but we can go to my house I don&apos;t mind" I said then we called an Uber that had a truck. We had like a 10 minute drive to my home city I lived in Ann Arbor my house wasn&apos;t gigantic but it wasn&apos;t tiny. We finally got there and we got out the car one by one Daniel walked over to me and held my hand his palm was sweaty so I squeezed his hand just to make sure he&apos;s fine I think he was nervous. Yes I was nervous I was thinking about what if her mom doesn&apos;t like me then again her dad doesn&apos;t even know we&apos;re together. I just hope I make a good impression to her mom. I told the guys to stay on the porch while I pressed record on my phone I unlocked the door and my Mon looked back and she instantly hugged me "oh my gosh you didn&apos;t tell me you were coming I missed you so much" she said while were still hugging I posted it on my story. "So when and how did you get here?" 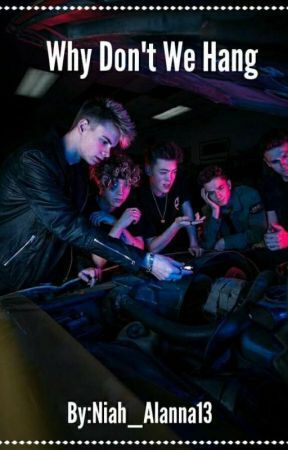 She asked "well I have some friends I want you to meet" I opened the door for them and they came in one by one "these are the Why Don&apos;t We boy&apos;s dad is managing" I said looking at my mom they all shook her hand "this is Jonah, Jack,Zach,Corbyn, and Daniel" I said pointing to each boy. "So what do you guys do?" my mom asked "We sing" they said in sync "why don&apos;t you guys sing something" I said and they started singing Nobody Gotta Know after that I showed them around the house "hey mom can you come in the backyard for a second" I said grabbing Daniel "sure" and we both followed her to the yard "so mom this is My boyfriend Daniel" I said and she nodded and smiled "wow this is exciting" she said clapping "and he&apos;s good looking too" she whispered to me "mom" I said then she laughed and went inside we were there for like 5 more minutes and we had to leave "bye mom" I said "bye honey she responded while giving me a hug and a kiss on the cheek "bye ms? What should we call you" Corbyn said "call me Elizabeth" my mom said "Okay bye Elizabeth" then we caught an Uber back to our hotel "your mom is awesone" Jonah said and I smiled and shook my head.